Journey and Rascal Flatts will headline the Super Bowl XLVII CMT Crossroads concert at the New Orleans Sugar Mill on Saturday, February 2nd at 9 PM, CT. The two bands join an elite group of performers who have participated on CMT Crossroads, the critically-acclaimed series that pairs country music stars with popular artists from other genres-pop, rock, R&B-to play together, swap stories and share their common love of music. 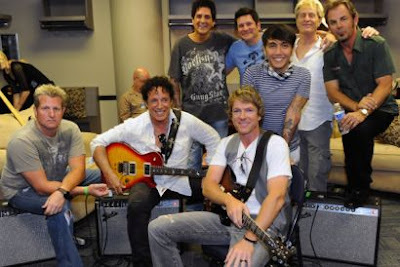 CMT Crossroads: Journey And Rascal Flatts will air on CMT on Saturday, February 2nd at 11 PM, ET/PT, the night before Super Bowl XLVII. Fans can register to be a part of CMT Crossroads as NFL Insiders here. Doors will open at 7 PM. The upcoming CMT Crossroads concert marks the second Super Bowl appearance for Journey: the band previously performed in 2009 at NFL Tailgate Party before Super Bowl XLIII in Tampa, Florida. This also marks the second collaboration between the two bands. In June 2012, Flatts closed the CMT Music Awards by inviting Journey to perform their megahit “Don't Stop Believin'” with them on stage.